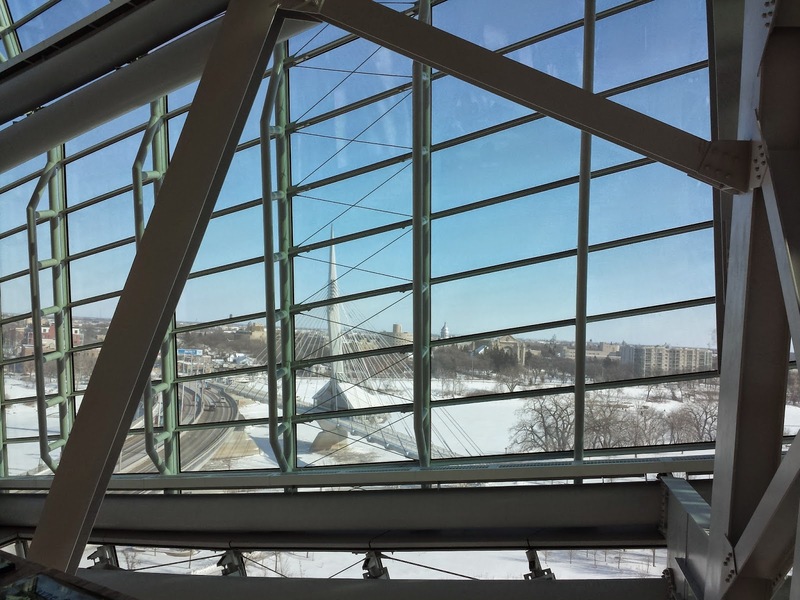 Yesterday, we decided to head on over to the Forks and pay our first visit to the new Museum for Human Rights. It was filled with a lot of heavy things to think about and tons of sources of inspiration. 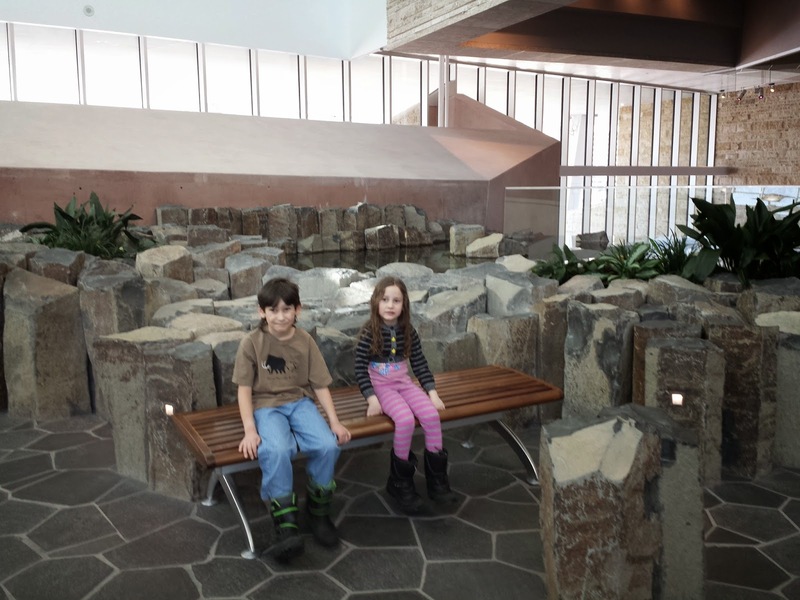 And the kids were surprisingly open to looking at the displays and found the trip interesting. I thought for sure they were going to be bored out of their minds and would bug us to leave early. We went through all 7 floors of galleries with a quick skip by some of the displays on level 4 (the attendants warned us that the holocaust displays might be too much for young children). I'm sure if we would have stayed a bit longer to read some of those displays - long enough for Logan to read some of them - we would have a very upset boy (and a very upset me as well). 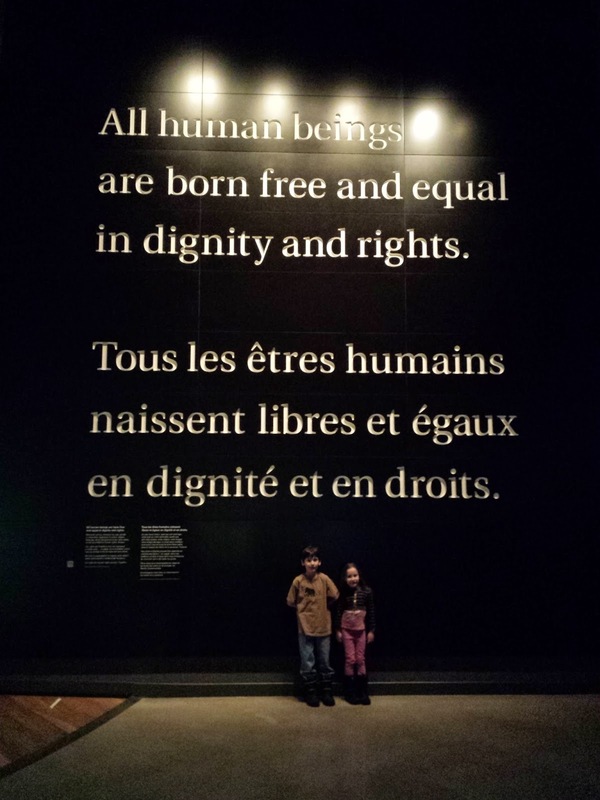 As it was, I was bawling through most of the devastating setbacks we've had as humans and then smiling at the displays of incredible courage and inspiration of people fighting for human rights around the world. A roller coaster for the emotions! While we were looking at the displays all around this huge room, there was this circle in the middle. 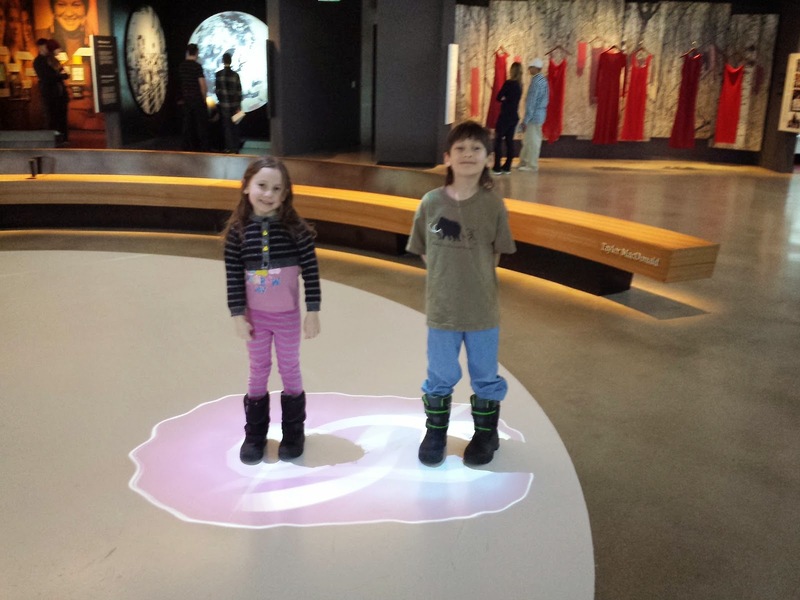 The kids discovered that if you walked across the floor in this area, a circle of light would follow you. And if you came together near another person your circle would expand to include that other person. 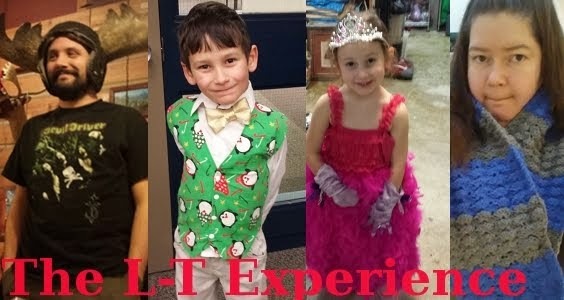 What a fantastic lesson in how people interact and influence each other as well as being such a fun thing for the kids to do while parents are busy. Tranquility garden. 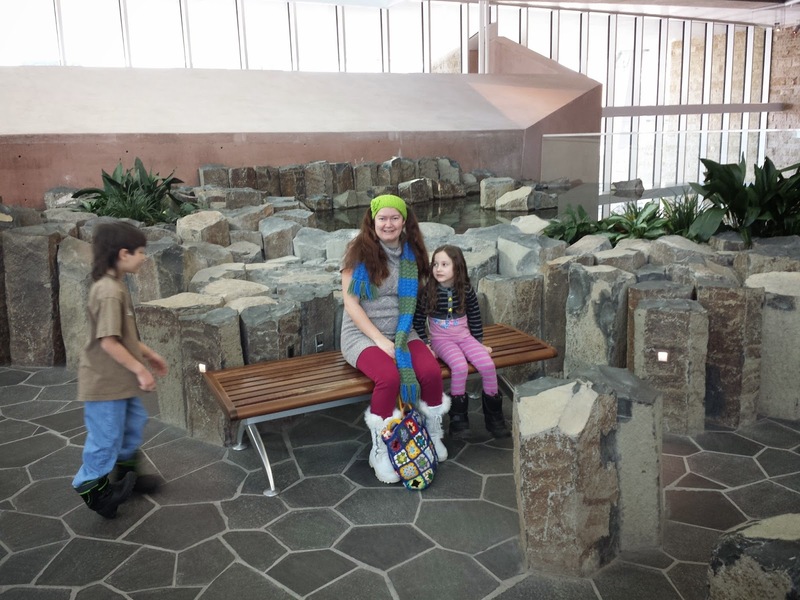 It reminded me so much of the healing garden at the hospital in Edmonton. 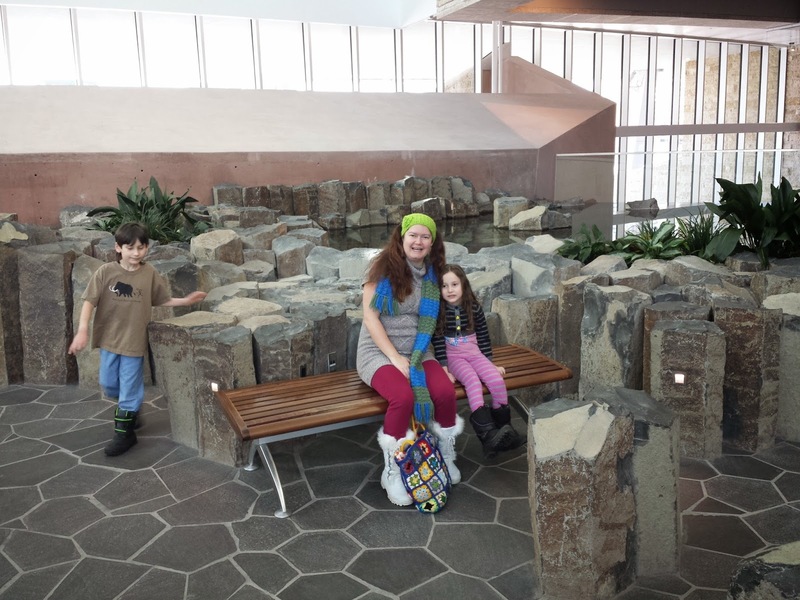 Logan was perfecting his "photo bomb" skillz. The view from the 3rd floor. Had to snap a photo of crochet. This display shed light on all the wonderful work grandmothers in Africa and Canada are doing. 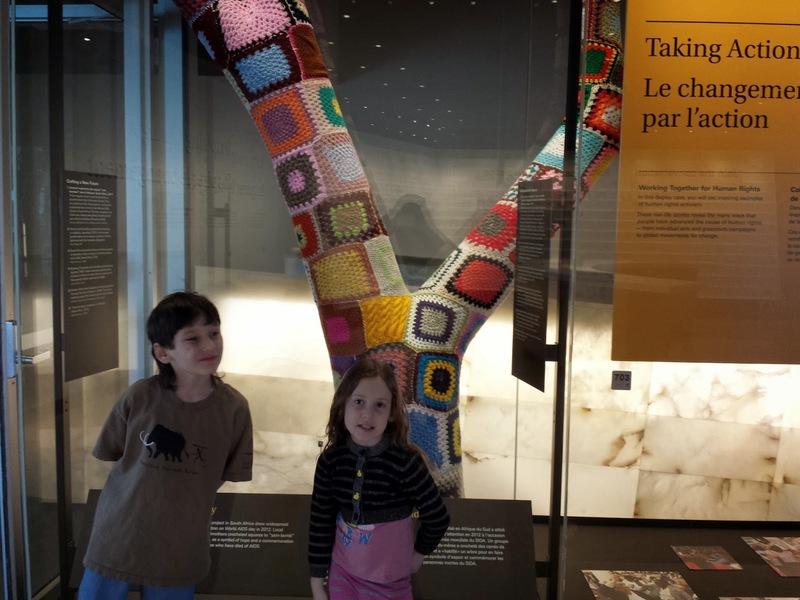 They have yarn bombed a tree with all these colourful granny squares to bring awareness to the AIDS crisis in Africa and around the world. 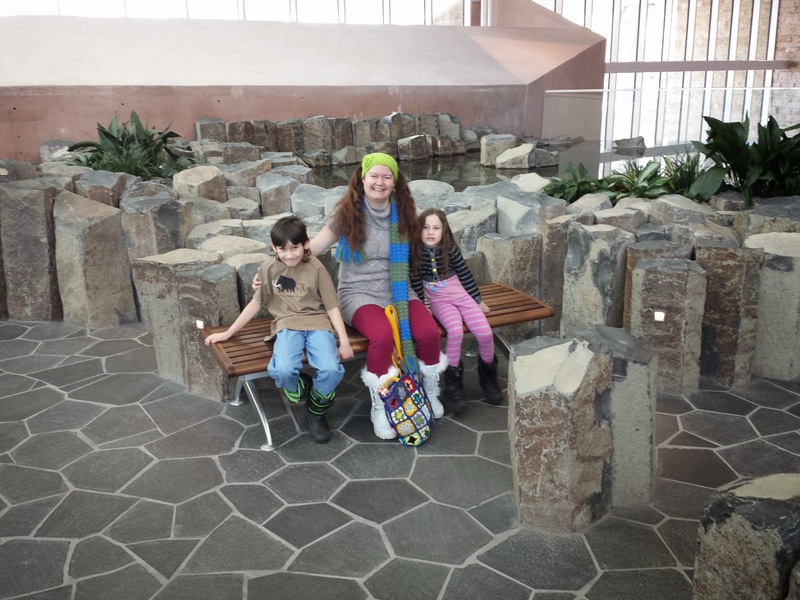 At the very end of our visit, we traipsed up several flights of stairs to the tower. I think Terry just about had a heart attack with the kids being ... well... kids... at high heights. 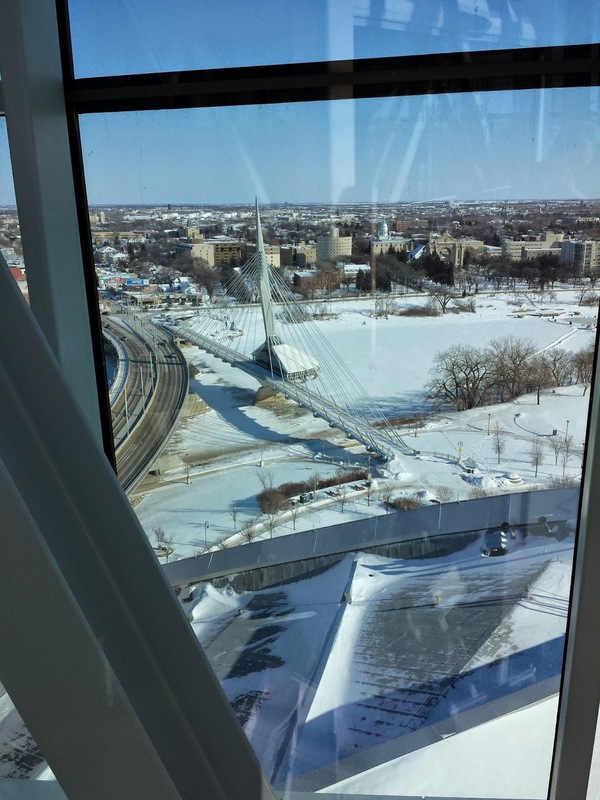 But they were well behaved and we got to see this view of the Provencher Bridge. Beautiful. What to do for this challenge? I went with something that always scares me. I figured I would screw it up so harsh that I didn't even bother trying. I always purchased this item ready made instead of going through the steps to make one myself. Yup... I am absolutely terrified of making my own pie crust. The store bought ones are good enough and they are all nicely rolled out and stuff. I made the crust the day before because the recipe called for putting it in the refrigerator for 4 hours or overnight. Then I took it out and let it sit awhile to get warm enough to roll out. It actually fit OK in the pie pan. I decided to make a rhubarb pie and dream of summer. The top looks pretty good for a first try. And it didn't fall apart or burn in the oven. Yay! And the rhubarb didn't seep out. And it was delicious. I'm not sure that this particular pie crust would be the one I would settle on, but it was yummy for the first try. And it gave me confidence to try out a few more recipes until I find one that is just right. Terry came home from work one day with a strange request. A co-worker of his had seen Link and Hobbes in the background of Terry's office during a video conference and really liked them. 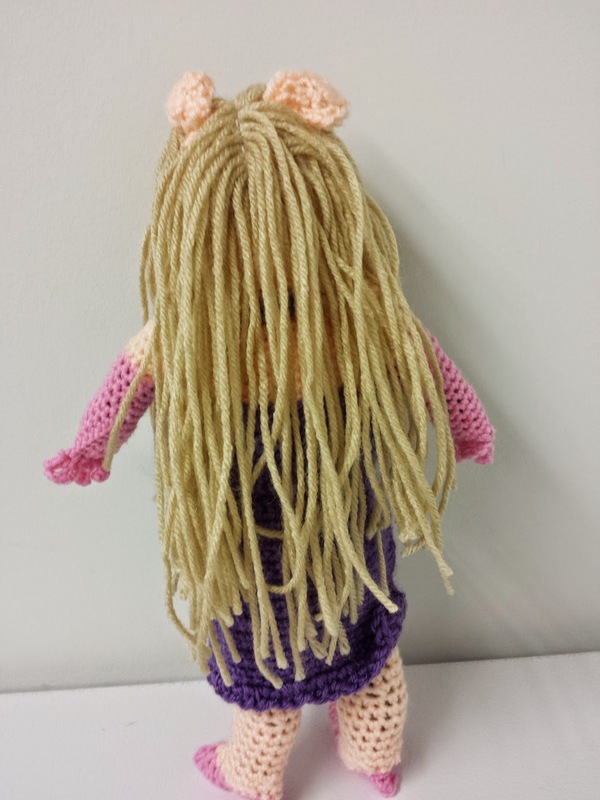 Terry told this co-worker that I had made those figures and was learning how to crochet. 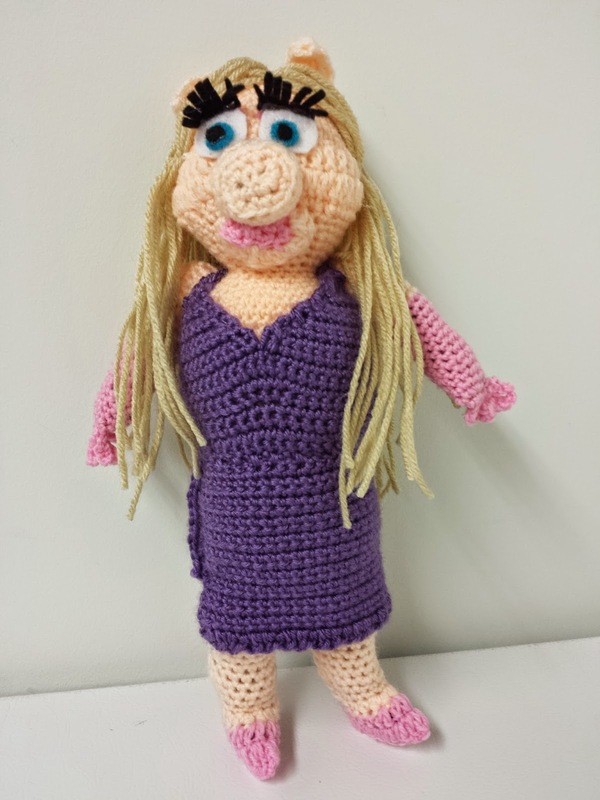 The co-worker then asked him if I could make a Miss Piggy in crochet. I put the request into the back of mind while Christmas was happening because I just didn't have time to attempt one. Then I totally forgot about it in January until Terry came home from work and said that the same co-worker asked again about Miss Piggy. I think she turned out fab-u-lous! 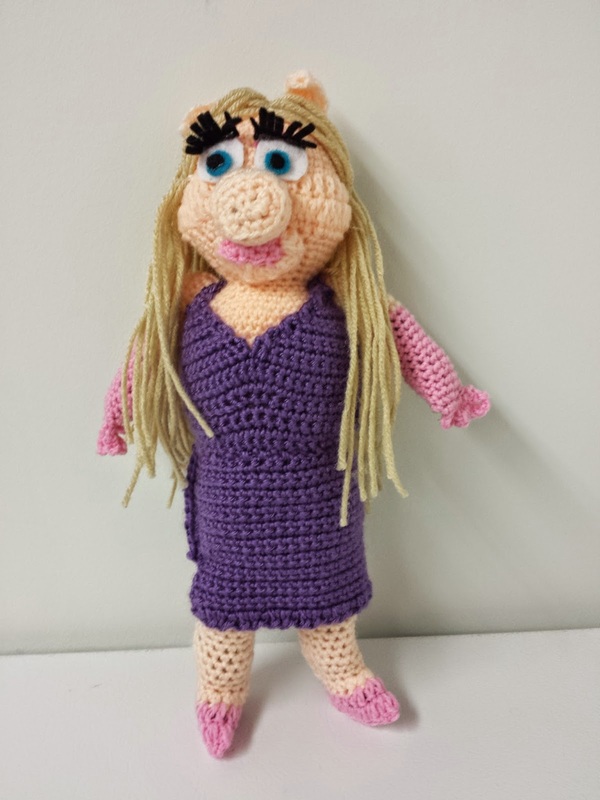 I used this pattern to make Miss Piggy. The pattern was great and left a lot of options open for hair colour and style etc. I decided to forego the featured 70s feathered hair look and go for a straighter look. I used peach colour instead of cream which I think was successful in making her "piggy" colour. 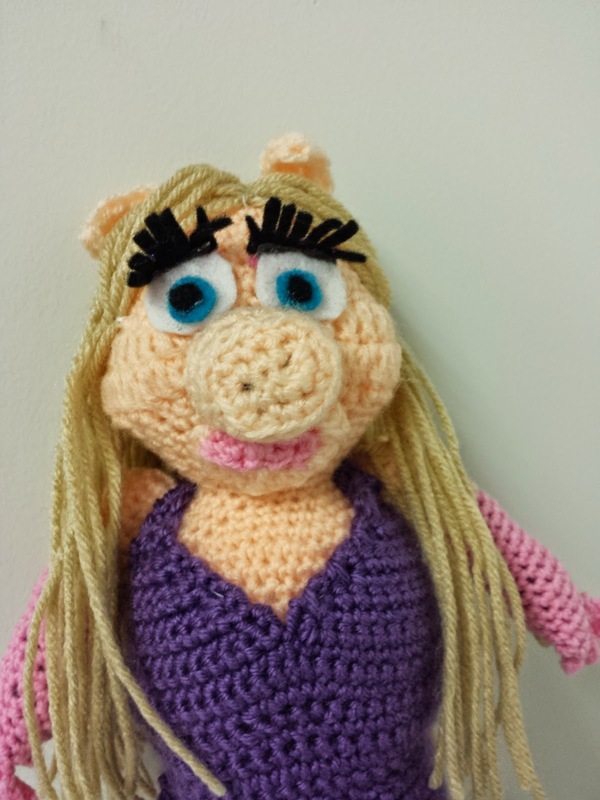 Terry took a look at the finished project and said that he didn't think Miss Piggy was all eyelashes until he saw it and then looked up a photo of the puppet and compared. She is indeed all eyelashes. I used felt for the eyelashes as I thought that that black yarn I had was too thick and heavy for fluttery eyelashes. She's pretty glamorous isn't she? 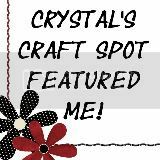 A link to my Miss Piggy project on Ravelry. 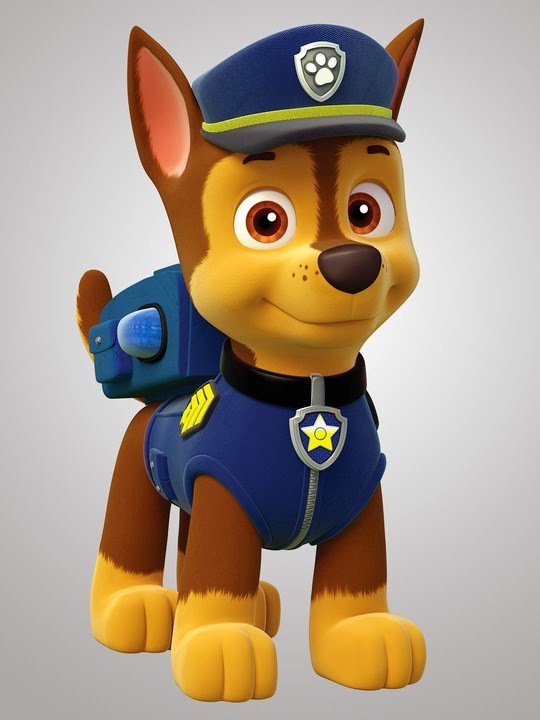 Of course, I don’t want any copyright problems by making an exact replica of Chase, so I decided to make my own Police Puppy. I decided to make my project for my very favourite little boy - Logan of course! He's been setting up the reading nook that I made for him for another Iron Craft challenge last year and asked if I could get him a large pillow. Why yes! I could even do one better and MAKE him a pillow! 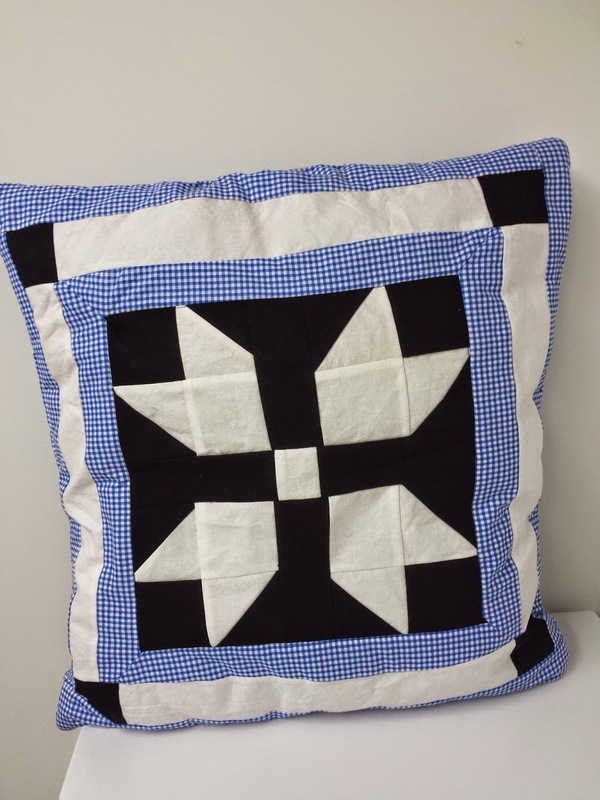 I found a great pattern for a big pillow in one of my vintage quilting books and got to work. Here's a photo of those corners. Iron Craft always gives me an excuse to try something that I normally would say I didn't have time for. Mitered corners definitely fit on that category. I didn't do too badly with the matching up the block pieces either. 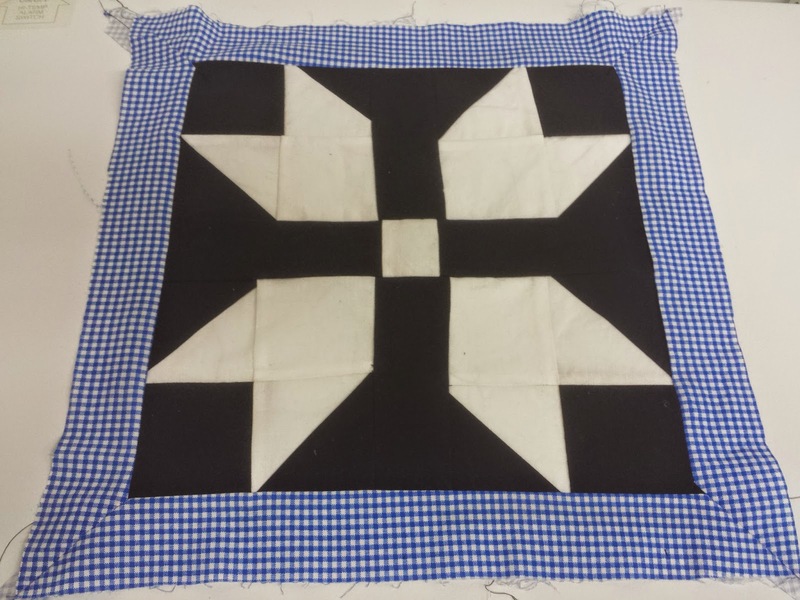 I did a new technique with the 2 triangle squares using a grid and sewing diagonals that worked really well to get nice uniform squares. What's most important though is that Logan loves it. I ran upstairs with his new pillow and proudly displayed it in his reading nook. Yay! *** To see all the love-ly projects from the Iron Crafters, please check out the Flickr Group. Lane has really gotten into a show called Paw Patrol lately. I found a series of patterns on Ravelry to make each of the puppies on the show and Lane was instantly in love with each one. 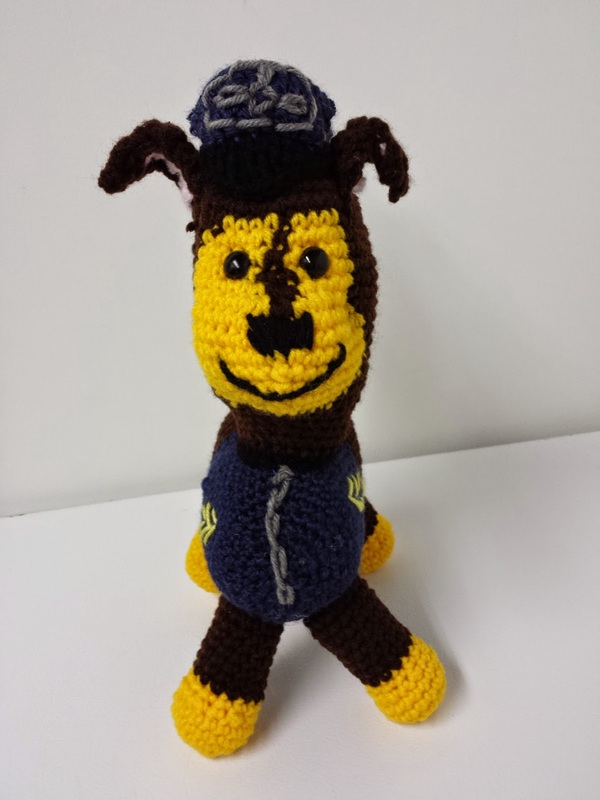 She chose for me to make Chase - the police puppy first. Does he look like the real thing? I admit - the fur could have been a little lighter, but I didn't want to purchase any more yarn for this project. I have been trying to keep to one storage bin full of yarn and it's pretty cramped in there right now. Ooops. 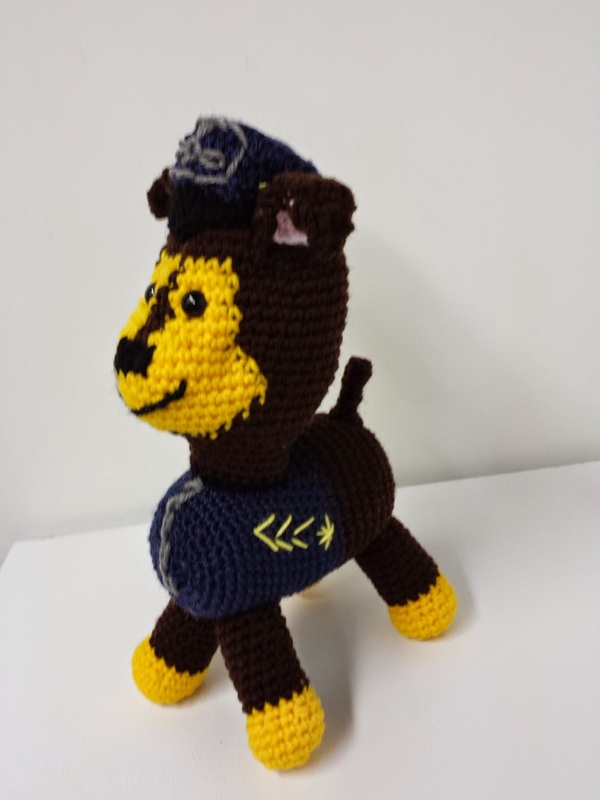 I used this pattern for Chase (purchased in the set with all the pups and Chickaletta). 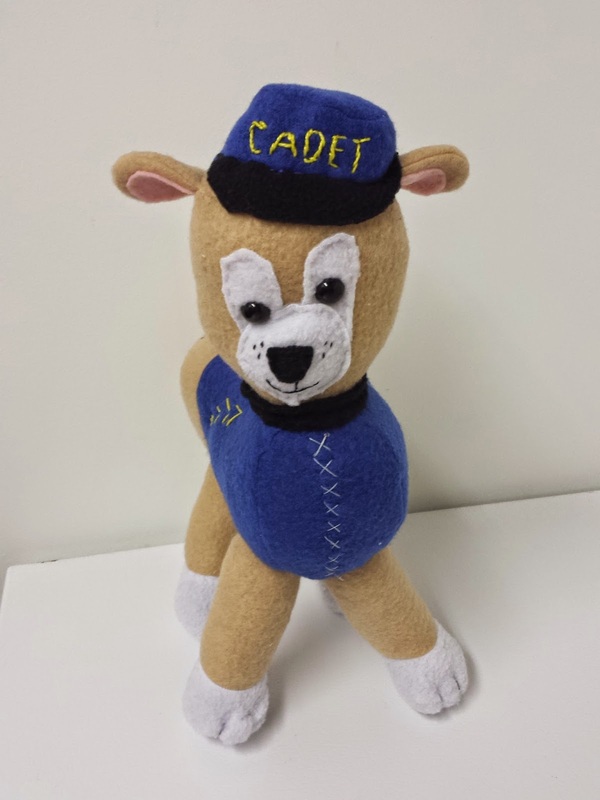 It was easy to follow and made a pretty treasured pup for Lane.